All welcome! 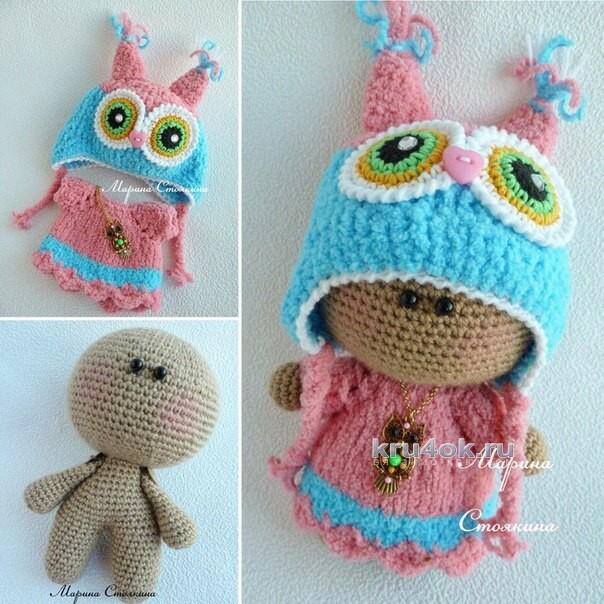 Very fond of creating interior toys and now I want to present You here such a sweet baby-owl! 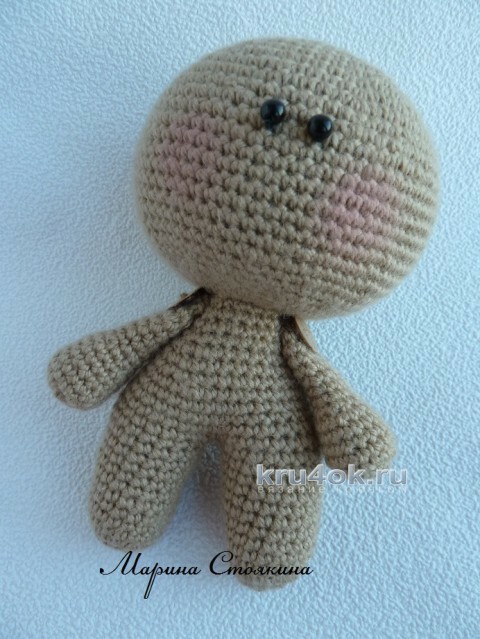 Baby knitted from wool mixture, a hook №2, handle movable on a thread mount. 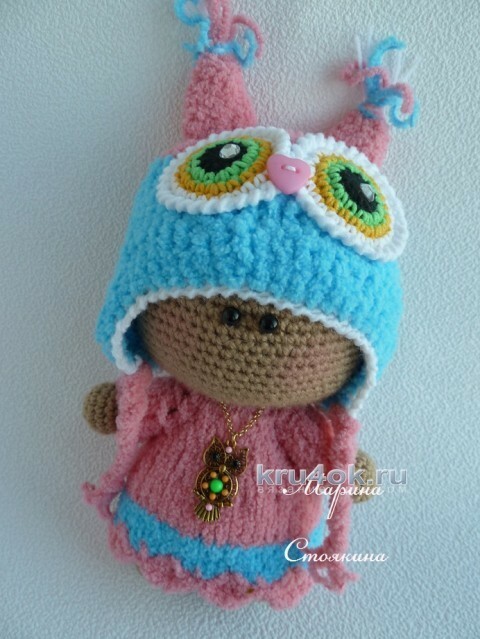 Clothing - hat and dress are made of plush yarn Alize SOFTY. details to fill tightly as knitting dolls. Arms stuff is not much, only the lower part. Ensure that obuvki in the body had exactly the sides of the doll. Between the head and the body, you can insert cotton swab. You can make a thread fastening of the hands to move. See MK from our site. To pull a hole, pin, and cut the thread. fit the hook on the classical scheme for SSN (12ССН in the ring, 2ряд - 24ССН, 3ряд - 36ССН, 4ряд - 48ССН, change the color 5ряд - 60ССН, 6, 7 and 8ряды - no raises, 60ССН). For the ears, under zavyazochki gained 14ССН from both sides and knit for 3 rows (with Obafemi for 4ССН in each row). Next white thread to tie the entire cap crayfish step to fix zavyazochki. Protruding ears: 6СБН in the ring, 2ряд - gain through the loop (9СБН),3ряд - more evenly 3 gain (12СБН), 4ряд - without of increases (12СБН). Tie tassels, sewn eyelets. 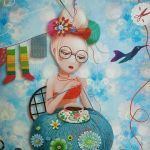 Eyes: black hair 12ССН in the ring, interrupts the thread; green thread knit - 1СБН, appr...- 12 times interrupts the thread; yellow thread knit - 2СБН, appr...- 12раз, the interrupted thread; white thread knit - 3СБН, appr...- 12раз, then tying the crayfish eye step. In the center or slightly offset glue strazik,he gives a glare...eye is ready!) The second eye similar to knit, sew exactly on the center ,the nose is a little button heart. The dress is knitted on the needles, Raglan top. The distribution of loops: 3(strap button) + 3лиц(back) + yo Raglan + K1 + yo Raglan + 4лиц(sleeve) + yo Raglan + K1 + yo Raglan + 6лиц(before) + yo Raglan + K1 + yo Raglan + 4лиц(sleeve) + yo Raglan + K1 + yo Raglan + 3лиц + 3лиц for looped strap = 30лиц loops and 8 nakido along the lines of the Raglan. Knit with extra 4 rows of the yoke, then the sleeves go down on extra thread, combine loop back and front into a single fabric. And in the first row do increase in each of the second loop, i.e. increase by one third. Next knit without of increases smoothly swivel front and purl rows to desired length. Do not forget to knit the stitches on the strap in the back, and the second six yellow buttons and then sew the buttons according to the size of the resulting loops. In order that the slats are not screwed in, I personally these loops knit garter viscous, i.e., in all rows only the front! But we all have our ways there and knit the way You want:) the bottom of the dress tied arches. The sleeves can be dobesilate for hosiery knitting needles in a circle without increases to the desired length, and you can write short, simple closing loop. Clothes, ready!